Dr. Scott Smith is a faculty member for Ohio University’s Online Master’s in Athletic Administration program. 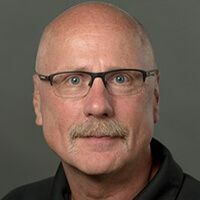 Prior to this position, he was an Associate Professor and Chair for the Department of Physical Education & Sport at Central Michigan University in Mount Pleasant, Michigan. He also served as the Director of the Sport Management program at Central Michigan, where he still teaches graduate courses in the program. Scott received his bachelor’s degree in Science Education from Bluffton University in Ohio, his M.Ed. in Athletic Administration from University of Nevada, Las Vegas, a PhD in Sport Management and an educational specification degree in Educational Leadership, both from the University of Missouri-Columbia. With the exception of four years of work in the University of Missouri Athletic Department, most of Scott’s professional experience prior to Central Michigan University was in interscholastic athletic programs. Scott served as an Assistant Principal and Athletic Director at single high school districts in Ohio and Missouri and also served as an Assistant Superintendent and District Athletic Director in two large districts: Dayton Public Schools in Ohio and Wichita Public Schools in Kansas. Even though his full-time position is currently in higher education, Scott continues to maintain his association with the National Interscholastic Athletic Administrators Association (NIAAA). Currently, he serves as the University Liaison and the Curriculum Coordinator for the NIAAA Leadership Training Institute.